Day 1 The first day begins at 8AM, meeting in downtown Anchorage at your B&B, or previously arranged location. As the city is probably not why you came to Alaska, we’ll escape forthwith heading northeast toward Palmer. We’ll make a stop at the native village of Eklutna to examine their uniquely characteristic cemetery with “spirit houses” before continuing on past Palmer and up the Matanuska River. Dividing the Chugach and Talkeetna Mountains, the deep valley of the Matanuska is quite beautiful as we head toward lunch overlooking its source and namesake, the Matanuska Glacier. From here we’ll rise to Tahneta Pass and enter into the Copper River Basin before reaching Glennallen for a Visitor Center stop and a turn north on the Richardson Highway. Following portions of the early Valdez-Eagle Trail, the road features high bluffs overlooking the mighty Copper River with the volcanoes of Mt. Drum, Sanford, and Blackburn beyond, eternally white with glaciers. 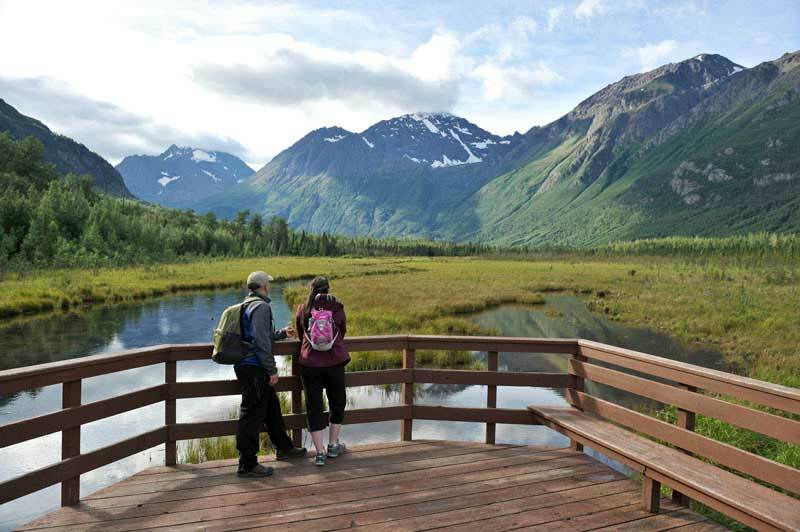 Continuing on into the Mentasta Mountains and through the Alaska Range, we’ll stop at a historic spot on the Eagle Trail for an interpretive walk, before arriving at the crossroads Tok. A grown up camp from the days of the emergency construction of the Alaska-Canada (Alcan) Highway during World War II, Tok is our home for the night. The Visitor’s Center has some remarkable photos of our most recent reminder of Alaska’s seismic youth, the 2002 Denali Fault Earthquake. Dinner is at Fast Eddy’s with lodging just out the back. Day 2 Twelve miles of the Alaska Highway leads to Tetlin Junction and the mostly gravel road to Canada, closed in the winter months. We’ll dawdle along the way before reaching the memorable little community of Chicken (name explanation on location). We’re now in the heart of what has long been known as “Fortymile Country”, named for the great river that drains the innumerable creeks that drew and still do, the hearty soul of the gold miner. An area of repeated gold rushes before and after the great Klondike, the Fortymile is beautifully rugged country, dotted with ghost towns and some on the verge of becoming such even though gold mining is still a primary vocation in these parts. After visiting an abandoned dredge, we’ll arrive in the outpost Boundary just before crossing the border into Canada. The famed Top of the World Highway (the name of which was inevitable with the sweeping vistas in every direction) leads us to the goal of all of the Klondikers, legendary Dawson City. Crossing the Yukon River by ferry, we’ll arrive on Front Street hopefully a bit less ragged than the multitudes that struggled so long and hard to reach here in hopes of fortune. The great irony was by the time most arrived, all of the valuable gold claims had been staked by those in the country at the time of discovery. Dawson still has a very distinct atmosphere from the old days with the dirt streets and boardwalks. Many of the old buildings remain, due simply to the fact that Dawson was soon forgotten by the rest of the world and dwindled in population, though now much is under preservation by Parks Canada. We’ll head out to the gold fields tonight or tomorrow, and wander around mammoth Dredge #4. Fascinating even to most that predict otherwise, the dredge is an amazing amalgamation of floating machinery and was the centerpiece of a type of mining and way of life that dominated the area for many years. Dinner and lodging in “downtown” Dawson, with a chance after dinner to lose your gold dust at the tables of Diamond Tooth Gertie’s. Day 3 We’ll leave room in the morning for a town walk led by a Parks Canada interpreter, wandering a photo museum and some intriguing shops before lunch. In the afternoon we’ll head “downriver” and cross back into the States, this time taking the cut-off to Eagle. The road from here narrows wonderfully, winding up and then down into the valley of the Fortymile and on through the haunting mountains until ending up on the banks of the Yukon River and the frontier outpost of Eagle. You can feel a different atmosphere as soon as you drop down from the mountains into town, passing the old log cabins and schoolhouse before arriving at the Yukon and another Front Street. This first was and is still, a working frontier town. The stories and characters of the present as well as times past, can’t help but fascinate. Accommodations for the night are in historic log cabins overlooking the river, two of which date from the earliest days of Eagle. In the main cabin Norwegian explorer Roald Amundsen often played poker with then owner Jack Hillard during the winter after he made it south by dog team from his ship frozen in the ice a thousand miles north, picking Eagle with the only telegraph, as means to inform the world that he had at last conquered the long sought Northwest Passage. Dinner is at the local cafe with the mighty river in front, disappearing hauntingly around bends in both directions . . .
Day 4 Eagle has remained an uncommercialized gem given its remote location at the end of the road. With its beginnings as the American center of commerce (and later order) in the region, Eagle is just four miles from the Canadian border and is one of the only almost untouched frontier towns of the early gold rush days. Still the hub of this part of the Upper Yukon at only 200 persons, far fewer people inhabit the area now than in its heyday. Most structures are of log and the town’s amazing historical society has done much to preserve its past, from the old buildings of Ft. Egbert to the museums and interpretive displays of a quality rarely seen in a tiny place so seldomly visited. We’ll take the walking historical tour that features many a treasure, guided by local folk with an obvious pride in their choice of home. It’s quite a unique neighborhood and you’ll undoubtedly want a bit of time to wander about and take a few photos, with an optional afternoon challenge of making it to the top of Eagle Bluff for some fantastic views. Dinner is a BBQ, overlooking “The River”. We will overnight again in the historic cabins, by now feeling almost a part of a very unique place on the planet. Day 5 After breakfast, a few more moments are open to relax and ponder before heading to the airstrip for the flight to Fairbanks. It’s universally with a bit of regret that one leaves Eagle, but the flight is an event in itself, driving home the isolation of the upper Yukon and the unforgiving country that separates it from, “civilization”. From the air is a perspective impossible otherwise, with the Yukon-Charley Preserve and towering Ogilvie Mountains to the north and the roadless and rugged Fortymile country below. The 200 air miles melt away in what must have been a dream to our predecessors toiling weeks to reach the same destination. With the second largest population in Alaska, Fairbanks serves as a hub for all of the northern part of the state. Even so, it retains a decidedly frontier flavor and its extremely harsh winters foster a sense of community alien elsewhere in towns a fraction the size. After installing in our hotel, we’ll wander to Pioneer Park, an area where early Fairbanks has been relocated, with many of the original buildings. It’s now a curious mix of history and commerce, with a wonderful pioneer and aviation museum. A true gem is the restored sternwheeler, Nenana, with a walk aboard giving insight into an entire way of life now vanished, upon which all of Interior Alaska depended for generations for almost every aspect of trade and transportation. Downtown Fairbanks is not far off, and though the contrast to its earlier version is apparent, Golden Heart Park provides a scenic and informative visit to the communities physical beginnings. We’ll have dinner nearby, and then if folks are inclined, head to a local watering hole. There’s a couple of famous ones to choose from, and it’s in such an atmosphere that one finds a quintessentially Alaskan phenomena–that appearance or garb give absolutely no clue as to the person or station in life. Collars of all colors mingle and the bedraggled soul standing nearby that you’ve taken for a logger, may well be the local magistrate just in from his homestead before returning to chambers (personal story!). Day 6 In the morning we’ll have a little more time to explore before the University of Alaska’s excellent museum (that’s recently been refurbished) opens with its extensive collections of early Native artifacts and cultural interpretive displays. This puts us close by the old mining community of Ester for a poke about, whose more recent reputation as home to numerous artists and practitioners of free thinking has given rise to the name “esteroids” for the local inhabitants. A particularly beautiful stretch of the Parks Highway leads south from here, as it passes through the Tanana Hills with great views of the distant Alaska Range to the south. We’ll stop for a look at the displays in the old railroad depot, as well as the nearby cultural center, of the primarily Native community of Nenana on the banks of the Tanana River, before entering the northernmost portion of the Alaska Range. We’ll spend the night in a lodge in Healy just north of Denali Park, to allow an opportunity for flightseeing of Mt. McKinley and Denali Park from the local airstrip (approx $400/person). It’s an option highly, highly recommended but should the weather not be conducive, we’ll have another chance the following day. Day 7 As the vast interior of Denali National Park is closed to private vehicles, we’ll explore its wonders via a roughly six hour trip by shuttle bus with knowledgeable guides, operated by the park concessionaire. 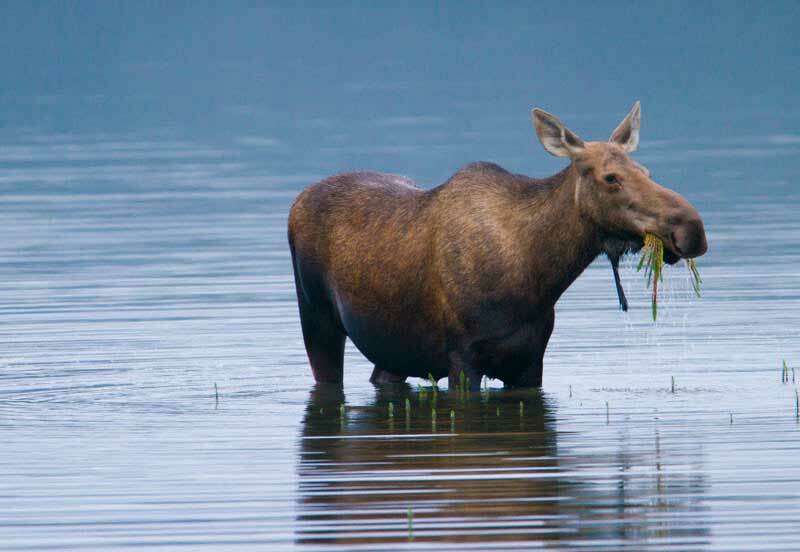 Even if “The Mountain” is not “out”, there is still the chance to see caribou, moose, Dall sheep, bears and wolves in the wide open vistas, with the vehicle stopping for wildlife or scenic photos whenever anyone would like. 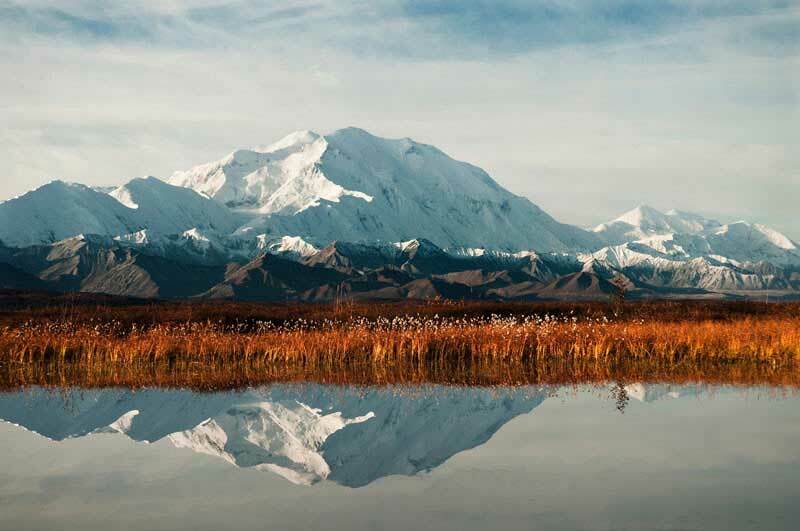 At two and one half million acres, Denali is large enough to encompass an entire ecosystem, and so remains a truly unique environment for study of wildlife behavior unaltered by encroaching development. If inclined, there are some great optional hikes to get an even different perspective of the park before we leave the Alaska Range in the afternoon and head towards the charming village of Talkeetna. An old mining town, Talkeetna now serves as the principal staging point for expeditions to North America’s highest peak, Mt. McKinley. Climbing parties from around the world can be seen preparing for and returning from one of mountaineering’s most famous challenges, and the village airstrip buzzing with ski-equipped bush planes servicing the mountain’s glacier base camps. It’s here that we’ll have another option to experience the mountain a little less painfully than the climbers, through flightseeing. 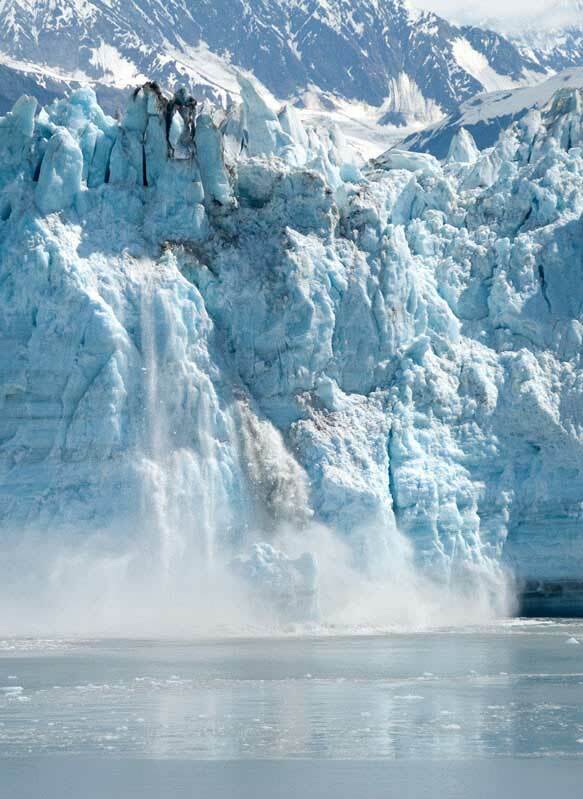 Sliding between towering peaks and over monstrous glaciers, this is an indescribable glimpse of a world few experience. From our lodgings, you’ll have the evening opportunity to explore some of the unique attractions of town, from the various boutiques of northern artistry, to the great little museum, to additional “wildlife” viewing at the colorful bar in the historic Fairview Inn. Day 8 We’ll head south this morning, through the fertile farmland of the Mat-Su Valley, and into the community of Wasilla – the first evidence that we’re trickling back toward civilization. It is here that is headquartered the Iditarod Trail Committee just off the main road. A visit to the organizational base of The Last Great Race, the 1000 mile Iditarod Sled Dog Race, allows one to consider the surprising intricacies of a resurging form of ancient competition, that is as much an intense lifestyle commitment as it is a sport. Any notion of dog mistreatment is quickly dispelled when one witnesses the level of care and devotion the mushers have for the true athletes of this intriguing sport. Having lunch at the historic Teeland’s Store, allows us a measured pace before afternoon reentry into the throng of activity that is Anchorage. The contrast with worlds just visited may make your mind wander to thoughts of a winter trail lit by the northern lights, a team of dogs stretched out in front as the trees glide by . . . there is still time to sign up for the Iditarod only a few months away . . . While visiting some of the North’s more famous attractions, this tour still manages to skirt the crowds and offer more than a mere glimpse of some very special places. From the easily recognized names such as Denali and Dawson, to the ends of the road in Talkeetna and the “secret” gem Eagle, this itinerary encompasses a wonderful cross section few visitors have the privilege to experience. The staggering grandeur of the wilderness traversed, from the Alaska Range to the varied Interior, provides a contrasting backdrop to the fascinating cultural and historical attractions we’ll explore in places where the human dramas are equally captivating. The land here is overpowering and dominates all. We’ll experience both what first drew and sometimes drove mad, the earliest settlers. The stark peaks never free of snow, the ceaseless flow of the mighty Yukon, the glaciers that still carve the land –these are Alaskas that most will never know. Our mandate for this itinerary is to capture a bit of that same spirit. While only eight days, the pace of this tour allows ourselves time to steep in these places that can’t fail to leave strong impressions. Contrasting destinations and an intimate variety of travel, from road to plane to river, serve to foster a deep appreciation for the uniqueness of these lands. This is not simply a tour of the North, but without roughing it, a journey through its elemental facets. Some come merely to say they’ve been to Alaska, but others aren’t content with such a cursory look. If you’re of the few where the name alone has long called, then this may be the tour for you.